Colony Green Condos in San Jose in the Blossom Valley Area. You are here: Home / Colony Green Condos, Blossom Valley, San Jose. 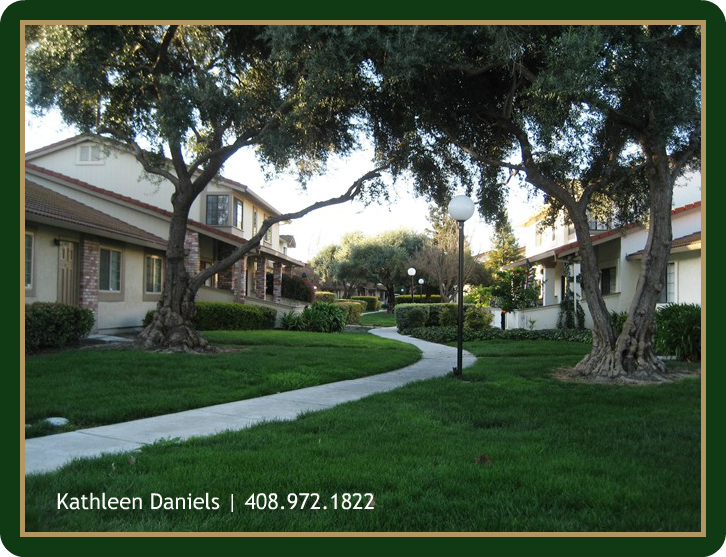 The Colony Green Condominium Community is located in Blossom Valley in San Jose, California. The community is tucked away at the dead end of Chynoweth Avenue and Duesenberg Drive and continues from Duesenberg Drive to the corner of Avenida Arboles. The back of the complex on Colony Field Drive faces the open agricultural space which is part of Martial Cottle Park. The community was built in 1984 by The William Lyon Company. There are 288 individual units in the Colony Green Condos Community. Each of the 72 buildings is comprised of a Plan A, Plan B, Plan C, and Plan D unit. Plan A Units are lower units and are 942 square feet. They have 2 bedrooms, 1 bathroom, inside laundry, private enclosed patio off the living room and an attached 2 car garage which provides direct access into the home. Plan B Units are upstairs and are 919 square feet. Access to these units is made by an exterior stairwell. There is no access to the home through the garage. They have 2 bedrooms, 1 bathroom, inside laundry, a front porch and a 2 car garage. The living space is essentially above the Plan A and B unit garages. This means the A and B units do not have neighbors living above or below them. Plan C Units are 2 story middle units and are 1,260 square feet. They have 3 bedrooms and one and a half bathrooms. There is a half bath downstairs and a full bath upstairs accessible off the hall as well as the Master Bedroom. The Master bedroom has a separate sink in the dressing/closet area. A differentiating characteristic of this unit is the vaulted ceiling in the living. This unit has a large front patio and an attached 2 car garage which provides direct access into the home. Laundry hookups are located in the garage. Plan D Units are the end units and are 1,294 square feet. Most D units have 2 master bedroom suites upstairs. All D units have a half bath off the kitchen. This unit has a large front patio and an attached 2 car garage which provides direct access into the home. Laundry hookups are located in the garage. In the later phases of development at Colony Green Condos the builder modified the initial D unit floor plan from 2 master suites to 3 bedrooms; one master suite and two smaller bedrooms with a full hall bathroom. Prices in March 1985 ranged from 88,990 to $105,990. That represented $17,000 more for the 2-story C unit. At that time the C units were actually selling for $1,000 more than the end D units. While those prices will likely never been seen again in Blossom Valley or anywhere in Silicon Valley, the Colony Green Condos continue to be deemed “affordable” and a desirable place to live. If you are not already working with a real estate agent, Kathleen Daniels is happy to help. She will set up a property search and you will be notified by email when a condo meeting your specific needs is available for sale. You definitely want to work with an agent who knows the Colony Green Condos Community and how to get an offer accepted in a highly competitive market. Call Kathleen at 1-408-972-1822 to get started with your home search today. The community is like a little oasis. Many original owners still live in the Colony Green Community. It’s centrally located and pet-friendly. As for amenities such as a pool, clubhouse or anything else, there are none. However, Martial Cottle Park is within walking distance and has several access points … the closet being at the corner of Chynoweth Avenue and Duesenberg Drive. As you might imagine with so many mature trees and shrubs throughout the community there is a fair amount of wildlife that also live there. Squirrels are plentiful as are many varieties of birds, including mourning doves. You may frequently find Cooper’s hawks resting on the light poles on Chynoweth Avenue as well as flying in and around the community. When it comes time to sell your Colony Green Condo call Kathleen Daniels at 408.972.1822. No body knows the community better. Listen to what John Haake has to say about the sale of his Colony Green Condo. Living on the East Coast John relied upon Kathleen Daniels, Managing Broker-Owner of KD Realty to manage his tenants move out, hire contractors to do some work, coordinate staging and ready the condo for sale. You can read more regarding this sale in the Colony Green Community here.